We hope you enjoyed the holiday season surrounded by great food and all of the people you love. We have a lot to be thankful for as we look back on 2016 and we owe it all to our incredible customers – so thank you! In celebration of our 100 year anniversary we really went All Out, All Year Long. From the 100 Days of Food campaign benefiting Feeding America, to our expansion to Chicago, Illinois, then back to Bristol for the first annual Battle of the Burgers, October with it’s record breaking donation for the American Cancer Society, and finally, the introduction of a number of delicious new favorites including Illg’s sausages. What A Year! Thanks to each of you for being a part of the best year in our company’s history and for your continued support as we move into 2017. All this cold weather has craving warm and hearty foods and what’s more comforting than a few Italian classics?! Need we say more? This recipe couldn’t be easier and the wilted spinach is absolutely to die for. So rich and delicious, make plenty for leftovers! Brown onion, garlic and sausage in olive oil. Drain well. Add oregano, rosemary, basil, tomatoes and chicken broth. Simmer for up to 1 hour. Just before you serve, turn off heat and add tortellini and spinach. Cover for 8-10 minutes. Garnish with Parmesan cheese and season with salt and pepper. If your pants are still a little tight from the holidays, this recipe for egg noodle lasagna is the perfect pick for you. Not nearly as heavy as traditional lasagna, but just as satisfying. Brown onions, meat and garlic. Drain off fat. Add tomato sauce, super, salt, pepper and spices. Blend softened cream cheese, cheddar cheese and sour cream. Layer noodles, meat mixture and cheese mixture. Repeat. Bake at 350 uncovered for 30 minutes. Then at 400 for 10 minutes. Thanks again and we look forward to another fantastic year! If you’re looking for an unbeatable Grilled Pork Chop Dinner recipe complete with a drool-worthy glaze and creamy side you’ve found the right blog! 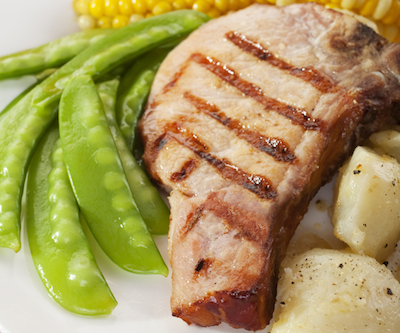 Honey Tabasco Pork Chops and Creamy Butter Beans is sure to become a favorite on your family’s dinner recipe line-up. You can order everything you need for nearly any meal directly from Passanante’s Home Food Service and have it delivered to your home with our reliable home food delivery service. Give us a call at 1-800-772-7786 to find out more about our incredible selection of quality meats and organic veggies and simplify your mealtime! 1. Heat honey in a sauce pan on medium heat. 2. Add tabasco sauce, minced garlic and red pepper flakes. 1. Sweat the leeks, thyme and garlic with a splash of olive oil and the butter in a heavy-bottomed saucepan on a low heat for 20 minutes until they are soft and sweet. 2. Turn up the heat and add the white wine. 3. Let the wine come to the boil, and add the beans and a splash of chicken or vegetable broth so the beans are almost covered. 4. Allow to simmer gently for 5 to 10 minutes until the beans are lovely and creamy. To help combat the chill of winter we’re bringing you a couple new recipes that will fill your home with warm, delicious aromas, and heat you up from the inside out! It may be a little cold to man the grill these days, so take advantage of these wintry months and master your meals on the stove top! In a small bowl combine picante sauce, water, soy sauce, cornstarch and ground ginger. Set aside. In a large skillet or wok over high heat, heat vegetable oil. Add the meat and stir-fry 1-2 minutes. Remove with a slotted spoon and set aside. Add garlic, mushrooms, green onions and peppers. Stir-fry for 3 minutes and return the meat to the skillet. Cook and stir about 1 minute or until the sauce thickens. Serve over rice with additional picante sauce. Salt and pepper pork chops on both sides. Heat oil in a skillet and brown the chops on both sides. Remove and set aside. Add celery, garlic and onion to skillet and cook until tender. Add soup and seasonings to the veggies and stir until heated through. Remove 1 can measure of the mixture and reserve as gravy. Add water and rice to skillet and combine by stirring. Pour into 9 x 12 pan and top with the pork chops. Bake at 350* for 30 minutes and serve with warm reserved gravy. This recipe for root beer pork chops is the perfect meal to whip together after a long day when your brain and fried and all you want is a delicious meal and your favorite TV show. Root beer pork chops are super easy to make and save pretty well ensuring you’ve got an equally irresistible lunch the next day. Even better news? If you’re a Passanante’s Home Food Service customer you have the peace of mind that comes with knowing the pork you’re preparing is high quality, locally raised and corn and grain fed. No unsettling secrets about where your food is coming from! Combine pork chops and two bottles of root beer in a large tupperware container and marinate in the refrigerator for approximately 2 hour. Remove pork chops from the marinade, pat dry with a paper towel and season lightly with salt and freshly ground black pepper. 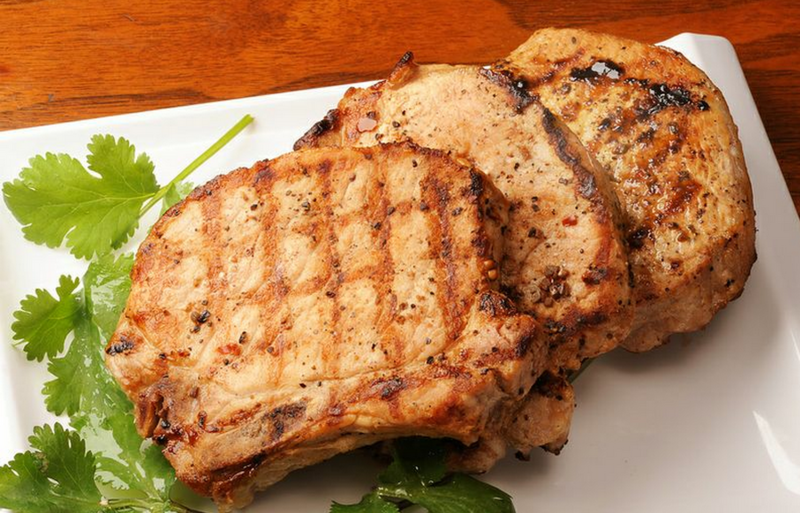 Grill the pork chops for about 3 minutes on each side before removing from the heat and allowing them to rest. In a saucepan combine the remaining bottle of root beer, beef stock, brown sugar, chipotle seasoning and Worcestershire. Simmer and reduce the sauce by about 75% until it is the consistency of syrup and add the fresh cut rosemary. Plate the pork chops and top with a few large spoonsful of the sauce. Serve these delicious chops with grilled asparagus, and a loaded baked potato, or next to a flavorful rice and steamed veggie medley.